This San Diego home buyer had a house with swimming pool before and was aware that there were issues with the pool. We noted in the home pool inspection report that the University City home had a small pool with separate fiberglass hot tub. The swimming pool appeared to have been neglected for quite a while. The potential home buyers was worried the pool may be a safety hazard for children. Our pool inspection included looking at the swimming pool surfaces, the condition of the fiberglass spa and the pool and spa equipment. The swimming natural stone pool coping was in very poor condition. In many areas the sandstone coping was broken or cracked, causing very sharp, rough edges, which were definitely a safety hazard. The natural stone has also began to degrade, causing uneven areas and exposed mortar joint areas that are also a safety hazard. A note was made in the pool inspection report that the extensive areas of damage to the coping meant all of the coping should be replaced. 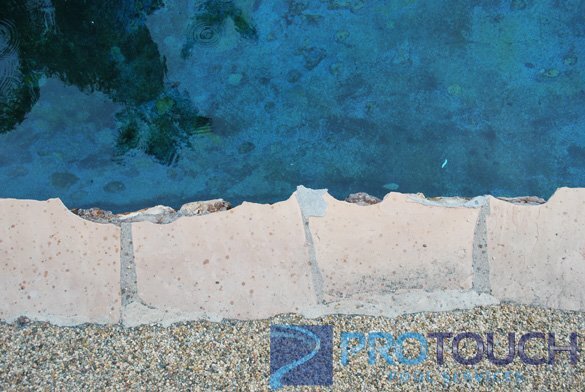 At the pool water line was a natural stone made of a rough, porous stone that looked to be in solid condition. However it was very rough and we would recommend replacing upon replacing the swimming pool coping. 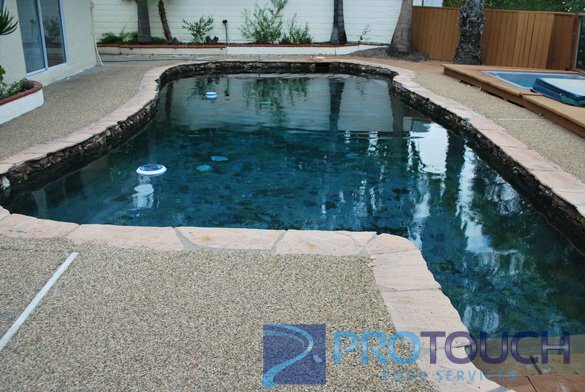 The pool plaster was in very poor condition and needed to be replaced entirely. 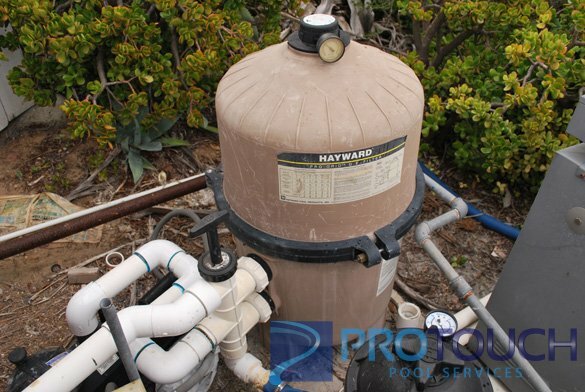 The swimming pool equipment at the San Diego home included an older Hayward RS pool circulation pump that was in fair condition and had no visible leaks. 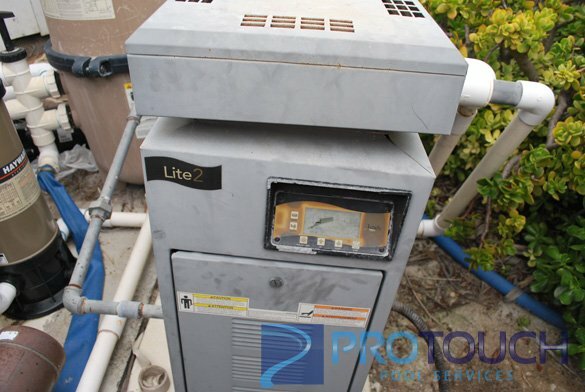 Connected to the pool pump was a Hayward Pro-Grid d.e. pool filter which also was in fair condition. In our written home pool inspection report, we always recommend to clean the pool and spa filter prior to using the pool and hot tub once the home is purchased. After looking at the filter the pool filter was inspected and was in good condition. The pool equipment plumbing didn’t have any visible leaks and didn’t need any repairs. 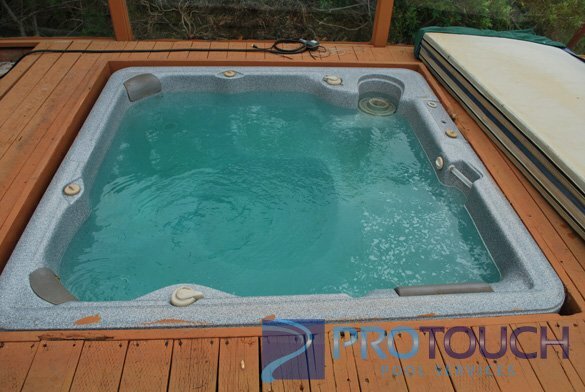 The hot tub was sunk into the pool deck and was in poor to fair overall condition. Some buttons were missing including the booster pump Len Gordon air switch. 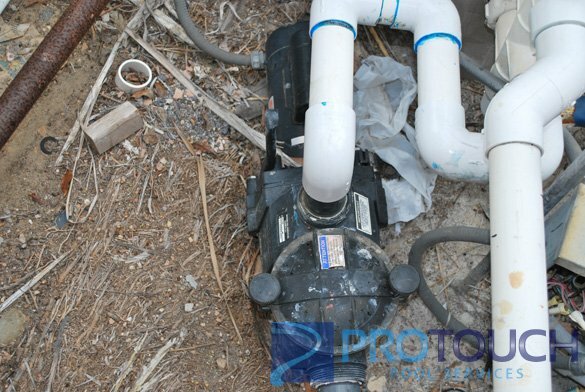 We made note in the home pool inspection report that because the air actuated on/off switch was not in working condition we could not verify that the spa booster pump was in good working condition. The Jandy Lite2 hot tub heater looked to be working though the display screen was broken and not viewable. We were also not able to see the heat setting temp. The home buyer was notified in the written inspection that the heater digital display should be replaced. We found several issues with the electrical wiring including a junction box missing a cover plate and other covers which were not water proof. Along with the written pool inspection report we provided pictures to verify our findings.